At the opening ceremony near the town of Ayrag in Dornogobi province on September 5, the American and Mongolian governments celebrated a major milestone—the successful completion of the Millennium Challenge Corporation’s North-South Road Project connecting the cities of Choir and Sainshand. Building on the success of the MCC project, the Asian Development Bank (ADB) completed a separate road project between Sainshand and Zamyn-Uud on November 20. For the first time in history, these developments allow Mongolians to easily travel across their country on an all-weather paved road, connecting them to their two neighbors, Russia and China. MCC’s North-South Road Project—funded by the U.S. Government and implemented by Millennium Challenge Account-Mongolia (MCA-Mongolia)—constructed 174 kilometers of road to reach key national and regional markets. 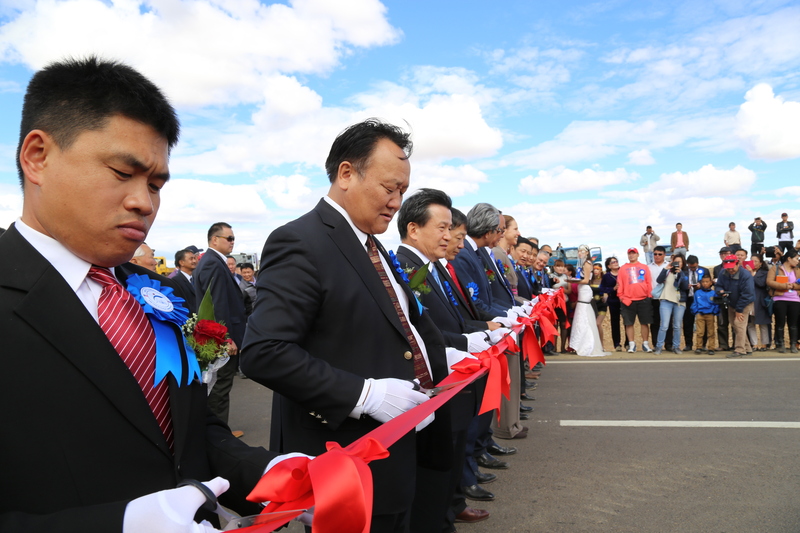 Two link roads were also built to connect thousands of Mongolians to the main corridor, and the project provided road maintenance equipment to the Ministry of Roads and Transportation for the sustainable upkeep of the newly built road. I’m proud of this project because it finished on schedule and will ultimately benefit more than 150,000 Mongolians. It is also an example of strong partnership and coordination: MCC and MCA-Mongolia collaborated with the ADB to assess road maintenance needs and received initial designs for the Choir-Sainshand road from the ADB. In fact, I’m proud of all the good work produced during MCC’s five-year, $285 million compact, which I’ve seen unfold firsthand during my 1½ years as the U.S. Ambassador to Mongolia. I’ve spoken with herders and urban beneficiaries who are receiving land titles for the first time, met students who intend to use their MCC-funded vocational education to find better-paying jobs and toured the newly equipped Cardiac and Stroke Intensive Care and Diagnostic Unit at Shastin Hospital in the capital, Ulaanbaatar. The completion of the North-South Road Project is particularly impressive given the limited construction timeline. Implementation began halfway through the five-year Mongolia Compact, following a major restructuring. Adding to these challenges, the initial construction contractor experienced financial insolvency at a time when there were only two construction seasons remaining in the compact’s terms. Mongolia’s harsh winters mean construction can only occur from April through September, and MCA-Mongolia worked diligently to keep the subcontractors from the initial contractor working to avoid losing a valuable construction season. After rebidding the contract, the two new contractors worked long hours to get work done on time, while adhering to the strict environmental and social standards set by MCC and MCA-Mongolia. The road is also a remarkable achievement because it reflects high quality standards. Many Mongolians view the road as the best ever built in their country because of its international-standard quality and technical specifications. In its funding, design and construction, the North-South Road Project is an example of what international efforts and cooperation among various donors and contractors can achieve. In all these ways, the road is more than pavement. It is a corridor to the new opportunities of economic development and growth. And, it will long be a symbol of a Mongolia on the rise and a testament to the power of partnerships to reduce poverty and replace it with prosperity.